Russian Drama Theatre named after Stanislavsky opened in Yerevan in 1937. In the creation and development of the theater took part Armenian directors L.Kalantar, A.Burdzhalyan, A.Gulakyan, V.Vartanyan. Yerevan Theatre has always been famous for strong troupe. In his repertoire policy has been focused not only on Russian, but also on the Soviet classics. One of the first theater in the country put on its stage duck hunting A.Vampilov, Nest capercaillie V.Rozova and East Stand A.Galina. 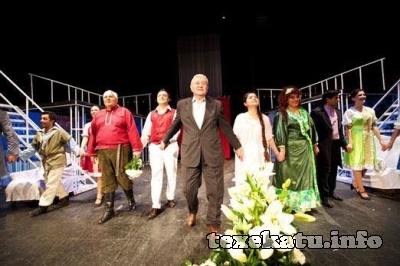 Since 1965, artistic director of the Yerevan Russian theater. Stanislavsky is Academician of the International Academy of Theatre Arts. National Artist of Armenia, honored Artist of Russia, winner of the Stanislavsky Theater Award. Professor, head of the acting workshop in Yerevan Theatre Institute, Alexander Grigoryan, a graduate of the Leningrad Institute of Theatre, a student of L.S.Vivena.